Everyone loves a good burrito, but have you ever wondered if people love a burrito on their head? This is a game that is not only challenging to play but will leave your students loving that they get to watch their friends try and catch burritos with their head! 1. Sombreros. You will need two of these as this game is most fun when there are two team competing at the same time. 2. Tacos. Here is where you can get creative. Feel free to go down your local grocery store and purchase those cheap 74 cent frozen burritos, and if you do make sure you allow them time to defrost. BUT you can go to your local taco joint or even a taco bell just make sure they are nice and fresh! 3. Rain Ponchos. Nothing fancy here, we just don’t want parents upset because the youth pastor thought it was a good idea to add a new ground beef stain all the way down the back of their child’s brand new shirt! 4. Probably A Tarp. Unless you are one of those folks who loves cleaning carpets or tile then lets just think ahead and throw a tarp down so all we have to do it wrap it up and throw it out! Draw two tape lines where the thrower must stay behind as well as the one catching the burrito on their sombrero. Purchase your burritos and you’re all set! This game can be done in teams of two as a competition, or versus mode with two players. Players put on a sombrero and stand about 10 feet apart. One player tosses tacos into the other players sombrero. At the end of the game the player with the most tacos in their sombrero wins. Go to Taco Bell and get sauce packets, burritos, chalupas, and cinnamon twists and assign them different point denominations. 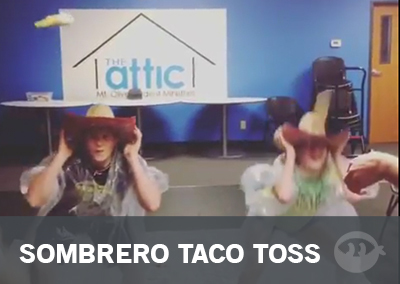 -Students might have to hold the brim of the sombrero to catch tacos. Ben is the contributor of this game and Director of Student Ministries at Mt. Olive UMC in Marion, IN. One of his life goals was to be Batman, but it turns out being a husband and father of two fantastic kids is way more awesome...and challenging. He loves teaching students of all ages about the love of God. Having fun doing ridiculous things at the same time is a bonus.